New Pleasant Grove campus aims to ease pressure on North Salt Lake school that opened in 2006, but demand still is high. 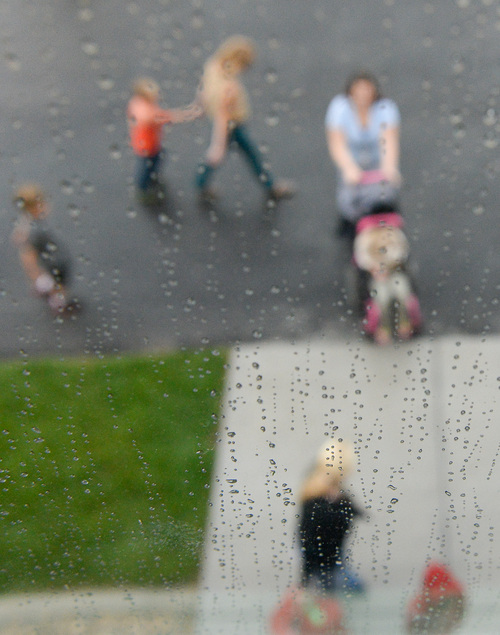 Francisco Kjolseth | The Salt Lake Tribune Kids return to class after playing in the rain at Spectrum Academy in Pleasant Grove. The public charter school, which primarily serves students with autism, has a long waiting list and currently has 430 students. Francisco Kjolseth | The Salt Lake Tribune Caleb Loertscher, right, takes a seat in Brooke Armijo's class where they learn in part about life skills on Tuesday, Aug. 19, 2104. It was the first day of class for Spectrum Academy, a public charter school that primarily caters to children with autism. 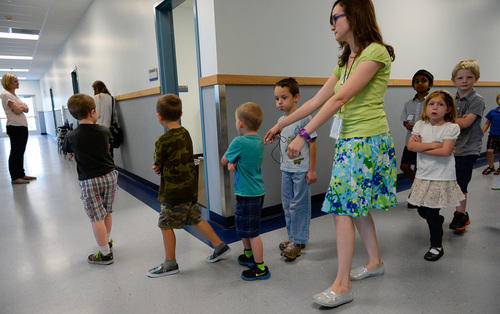 Francisco Kjolseth | The Salt Lake Tribune Spectrum Academy first-graders file down the hall during the first day of school at Spectrum Academy in Pleasant Grove. The charter school primarily caters to kids with autism and has a long waiting list despite just opening their second campus. Francisco Kjolseth | The Salt Lake Tribune Lights are kept off to keep students calm as they work through a lesson in Rebekah Thomas' first-grade class at Spectrum Academy in Pleasant Grove. The charter school, which primarily caters to students with autism, started their first day of classes on Tuesday, Aug. 19, at Spectrum's second campus. 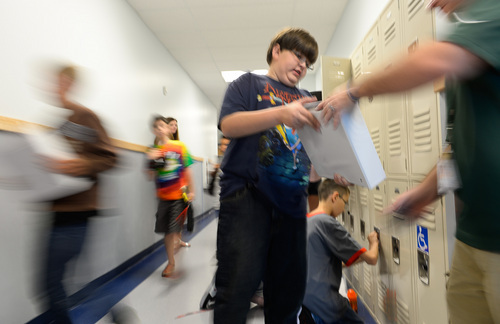 Francisco Kjolseth | The Salt Lake Tribune Spectrum Academy's second campus began their first day of classes on Tuesday, Aug. 19, 2014 in Pleasant Grove, as busy hallways were filled with students trying to figure out their classroom assignments. The charter school primarily caters to students with autism, and has a long waiting list to get in. 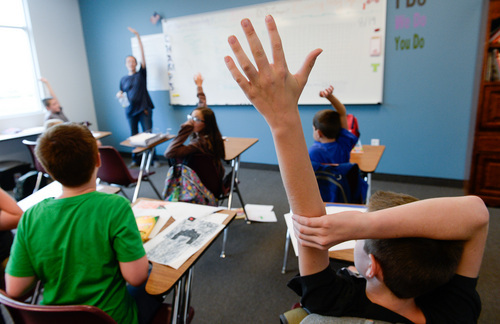 Francisco Kjolseth | The Salt Lake Tribune Fifth-grade students at Spectrum Academy's second campus participate in class in Pleasant Grove during the first day of classes on Tuesday, Aug. 19, 2014. 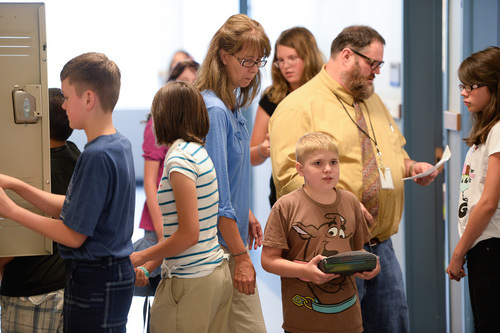 Francisco Kjolseth | The Salt Lake Tribune Spectrum Academy's second campus began their first day of school on Tuesday, Aug. 19, 2014 in Pleasant Grove, as busy hallways were filled with students trying to figure out their classrooms. The charter school primarily caters to students with autism, and has a long waiting list to get in. 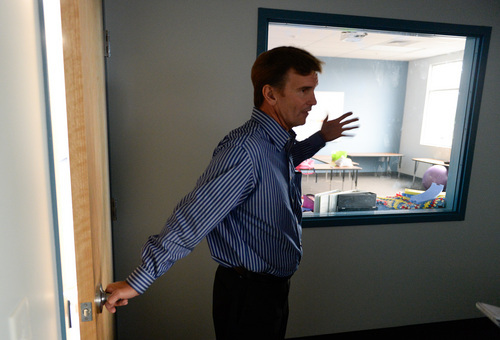 Francisco Kjolseth | The Salt Lake Tribune Brad Nelson, director of development and finance for Spectrum Academy, talks about an observation room built between two classrooms with one-way glass that aids in keeping track of students progress. The second campus just built in Pleasant Grove, primarily caters to kids with autism and has a long waiting list to get in. 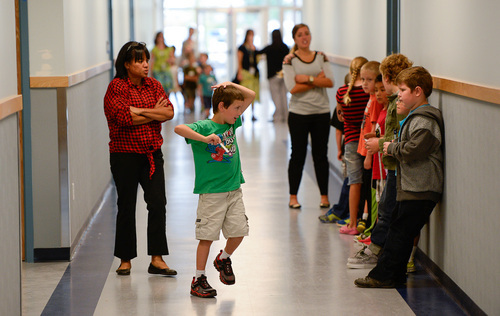 Francisco Kjolseth | The Salt Lake Tribune Spectrum Academy's second campus begins their first day of school on Tuesday, Aug. 19, 2014 in Pleasant Grove. The charter school primarily caters to students with autism. 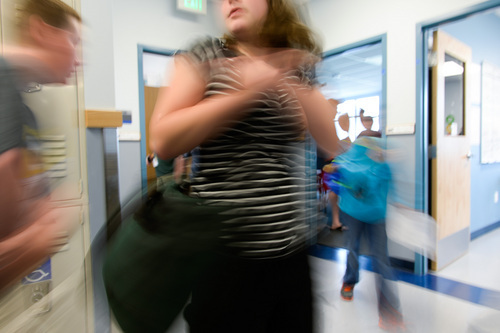 Francisco Kjolseth | The Salt Lake Tribune Spectrum Academy's second campus began their first day of school on Tuesday, Aug. 19, 2014 in Pleasant Grove, as busy hallways were filled with students trying to figure out their classrooms. The charter school primarily caters to students with autism, and has a long waiting list to get in. Francisco Kjolseth | The Salt Lake Tribune Brad Nelson, director of development and finance for Spectrum Academy talks about the non-flickering fluorescent lighting that was installed in the public charter school to aid students with autism. The second campus just built in Pleasant Grove, primarily caters to kids with autism and has a long waiting list to get in. Pleasant Grove • The first day of school at Spectrum Academy on Tuesday looked slightly different from others around the state. Sure, kids bounced through hallways toting new backpacks as teachers herded them into classrooms. But in many of those rooms, the lights stayed off to help keep students calmer. Youngsters fiddled with foam blocks or balls of clay to help them focus. Some flapped their hands, and others carried headphones to muffle sharp noises. "It&apos;s a place where the kids can feel safe," said teacher Brooke Armijo of the charter school&apos;s new Pleasant Grove campus, which opened Tuesday. The school is one of the few of its kind in Utah and the nation  a free public school serving kids with autism. The school first opened in North Salt Lake in 2006 and has since seen huge demand. This year, school leaders opened the Pleasant Grove campus to about 430 pupils in grades K-8, hoping to ease some pressure in North Salt Lake. But demand has surged. The North Salt Lake campus has a waiting list of about 675 students, and the new Pleasant Grove school already has about 150 on its waiting list, said Brad Nelson, Spectrum director of development and finance. Students were accepted to the new campus on a first-come-first-serve basis. Next year, a lottery will likely be held. The demand perhaps isn&apos;t surprising in a state where one in 54 children have been identified as having an autism spectrum disorder. 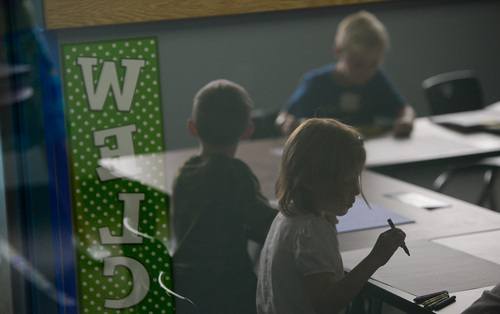 Utah has private schools serving children with autism, and regular public schools serve such kids as well, but the Spectrum campuses are the only public schools in the state specifically dedicated to the cause, school officials say. Children with autism range in ability, with some considered high-functioning, able to excel academically, and others unable to talk or perform basic tasks. "Once they feel secure in their environment and there are accommodations made inside the classroom," Nelson explained, "then they can learn because they&apos;re not mentally disabled; they just have issues that get in the way of their learning, and we try to clear away as many of those issues as we can." Jaime Christensen, Spectrum director of schools, said many Spectrum students also feel more comfortable socially at the schools. Children with autism often don&apos;t understand social and emotional cues and can get fixated on certain topics or interests. "It&apos;s really difficult sometimes, just in a neighborhood school, to find peers and teachers who are understanding when kids do things that are a little quirky," said Krisanne Lewis, a registered occupational therapist for the school. At Spectrum schools, she said, no one thinks twice about a student who sits on an exercise ball instead of a chair or talks obsessively about Pokémon. Kids also receive daily instruction in social skills  lessons that could range from how to ask for help to how to ask someone to a dance. On this first day, for example, teacher Victoria Simpson&apos;s fifth-graders filled out worksheets about themselves. On Wednesday, they will go around the room finding kids with the same favorite foods. The school&apos;s layout was designed for children with autism. The new Pleasant Grove campus, a 40,000-square-foot facility built at a cost of about $6.5 million, features many smaller rooms off of bigger classrooms so kids can get some space and quiet when needed. An observation room with one-way windows sits between the school&apos;s two self-contained classes  for children with the most severe disabilities  to allow educators to observe and collect data to improve instruction. The school also has space for occupational therapy and is working on creating sensory rooms, where children can take a break from lights and noise or, alternately, get lots of light and noise if they need the extra stimulation. Small class sizes are also important, with 12 pupils per class in kindergarten through second grade and 15 in grades three through eight. Each class has a teacher and a paraprofessional. About 80 percent of the students are considered special education, Christensen said. Some are not, but were enrolled because they have siblings at the school, didn&apos;t fit in at their regular schools or have other issues, she said. As a public school, Spectrum can&apos;t pick and choose whom to accept, but she estimates about 70 percent of the pupils have autism. Taylor Johnson, who attended the first day at the Pleasant Grove campus, is excited about her new school, especially because she can get special-ed services and be in the gifted-and-talented program at the same time. "It&apos;s awesome," said Johnson, 13, a set of pink headphones sitting in front of her. Eighth-grader Corbin Healy said not a lot of schools serve so many kids with autism. "It&apos;s going to be much easier," Healy said, "and I&apos;m going to be able to understand things more." The school plans to add a ninth grade next year, a 10th grade after that and so on, until it is K-12. Work on an addition to house the additional grades will start next year. 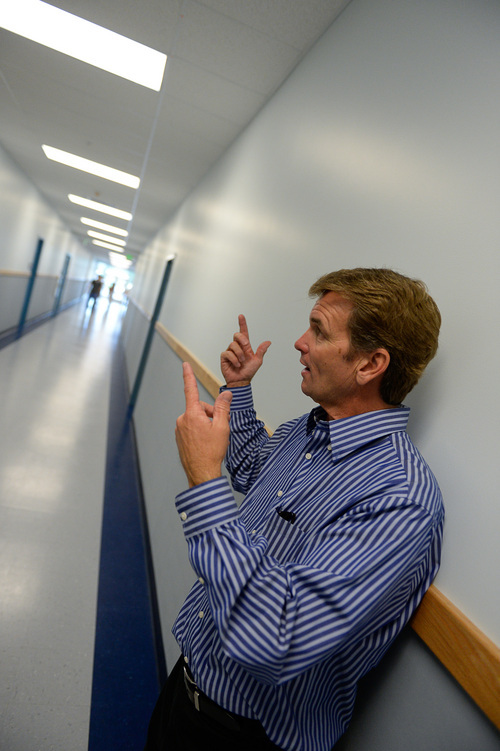 If growth at the North Salt Lake campus is any indication, the Pleasant Grove school won&apos;t have trouble filling seats. Many parents are clamoring for options. Andrea Spaulding&apos;s family moved from Connecticut to Utah two years ago so her son, who is autistic but high-functioning, could attend Spectrum in North Salt Lake. "He&apos;s made friends. He never cared about having friends before. He&apos;s excited to go to school. He used to hate to go to school," Spaudling said. "I think there should be Spectrum Academies all over the country."